Nice quite campground off the highway, so not a lot of road noise. We were in site 8, which was level and long enough for our motorhome. Power had good voltage, and location. Sewer in a good location. Owners and other campers were all very friendly. Some campers were booked for a month, and some longer. We enjoyed our time at Crystal Beach. We camped at Lazy Pelican RV Park in a Motorhome. Took the ferry (FREE) over from Galveston, on a Thursday. Wait time was not bad, and crew very efficient. Had a good meal at Stingaree's, and on Sunday morning, took the ferry back to Galveston to sightsee and have breakfast at the Sunflower Café (about 1/2 wait on Sunday morning, so get there early). Shopped at the "big box" store at Crystal Beach.....they have just about anything you need!! We follow the coast from Crystal Beach to Abbeville, LA.......pretty cool drive. Nice, clean campground, but a little over priced. Sites were nice long and fairly level. We camped at Cave Country RV Campground in a Motorhome. Mammoth Cave National Park 10 minutes down the road. If you plan on going, be sure to call ahead for reservations. We didn't, and we didn't get to take a tour, had to settle for a self guided tour (it was spring break). The National Park campground is right at the caves. Took a drive thru, no hookups, and not many very level sites, but it is close!! Cracker Barrel restaurant right around the corner from campground. Did some grocery shopping at the local IGA, not a bad little store. A little way off I59, but not bad. Campground sits on bank of Black Warrior River, with some river traffic. Some nice sites right on the river. We stayed in site 50, a nice long level concrete pull thru, with water and electric. This was only an overnight stay, but we would stay here again, and hopefully for a longer stay. We camped at Jennings Ferry Campground COE in a Motorhome. Just an overnight stay, and raining, so we didn't even get to take a walk around campground. Our site was close to the highway, with some road noise, but not bad after dark. Lot of transient workers, with only a few overnight camping sites. We were in site 47, which was not very level, but long enough for our towed vehicle. Power was not close to our site, used about 20 feet of our cable. Doubt if we would stay here again. We camped at Swan Creek in a Motorhome. Ate at Big Bob Gibson BBQ restaurant in Decatur, had some good BBQ. Campground is like three different campgrounds, one with water/electric, one with water only, and the primitive camping area. The water/electric sites are all paved, and most have some slope to them, and close to neighbors with shrubs/vegetation separating them. We stayed in primitive area.....all sites are level pull thru with no hook up.....BUT, pull thrus are long concrete, with concrete patio and picnic table, and not close to neighbors (we preferred the primitives site for 2 to 4 day stay). We had no Verizon cell service. First time we stayed at Seminole, we hiked to the Rio Grande (5-6 miles round trip).....BUT.....not this time, we did take a short hike though. We camped at Seminole Canyon State Park in a Motorhome. Visit Langtry, Texas to visit Judge Roy Bean Visitor Center. Drive to Pecos River overlook for great view of the Pecos River. You can take a ranger guided tour down into the canyon (Tour fee is $8 per person). Concrete pads, patio and picnic tables. Park is located where the Texas Colorado River empties into the Gulf of Mexico. RV park has a north and south loop with back-ins on the perimeter, and looong pull thrus in the center. Camp sites 4 thru 12 in the south loop have more yard area that other sites. Lots of campers come here to fish. We camped at Matagorda Bay Nature Park in a Motorhome. Cost reflects weekly rate. Sites kind of close to each other. Lot of park models, and RV snowbirds. Lots of activities if so inclined, only stayed a week, so we didn't get involved. People were friendly. 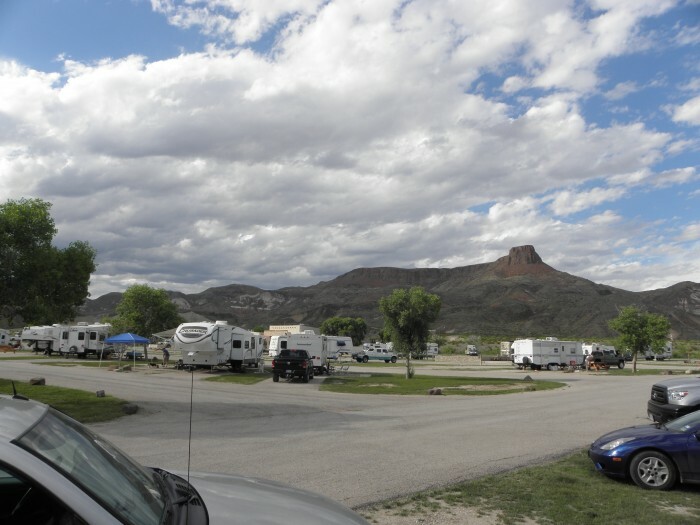 We camped at Del Pueblo RV Park & Tennis Resort (55+) in a Motorhome. We were here in January and February. Lots of snowbirds here for the winter, with their ATV's, to take advantage of the miles and miles of trails in the Arizona desert. Activities about every night in the club house. We would stay here again, but probably not for a month. Some sites can be a little tricky to enter and exit for big rigs. NO over the air TV channels!! Cost per day was monthly rate plus electric at 20 cents per KWH. We camped at Quail Run RV Park in a Motorhome. Quartzsite, Arizona is a small town, with not many options for grocery shopping, so stock up. January is when the big RV show takes place. Lots of RV dealers and RV vendors. Wasn't in the market for an RV, but did check out the vendors, didn't see any bargains. Parker, AZ about 40 miles away, with Walmart and Safeway. Bad Boys Café best breakfast and lunch in town!! Closest we could get to Lake Erie, but only about 6 miles from Geneva-on-the-Lake. An adequate campground, with not a whole lot of amenities, but did have a nice playground for the kids. Rained quite a bit one day (1+"), and our site was surrounded by water for a couple of days. Positive, is that campground is gated, and must have code to get in. Power and sewer good location, but water spigot at rear of site, had to use 50' hose. We camped at Willow Lake Campground in a Motorhome. This was just an overnight stay on our way to Lake Erie. 3 miles off I-71, in the country, so no road noise. Park is gated, with lots of amenities, and weekly activities. Utilities were all in good location and working order. Lots of seasonal campers, all in decent shape. Gave it a 6, just because I thought it was a little expensive for just a one nighter. We camped at Maple Lakes Recreational Park in a Motorhome. this park has plenty of amenities. Heated pool, 2 fishing lakes, playground, ball field, Bball court, and laundry facilities. Would be a good place for a summer stay. What a treat...."The Grand Canyon of Texas". Campgrounds are actually down in canyon, and road down is steep and curvy, but really not that bad. We stayed in Juniper campground, which is 4 miles from park entrance. 4 miles of beautiful scenery. Site 108 which was back-in, water and electric in good location, but use caution, as large rocks lined the site. Site also had shelter with picnic table. Texas was in fire ban, so no open fires.....wood or charcoal, but propane was allowed. Palo Duro Canyon needs to be on your bucket list. We camped at Palo Duro Canyon State Park in a Motorhome. 1. Visit Panhandle-Plains museum in Canyon, Texas. Allow at least 4 hours. 2. Visit RV museum at Jack Sizemore RV in Amarillo. 3. We also enjoyed the Charles Goodnight historical center in Goodnight, Texas. 4. We took a van ride with park ranger, which was very informative about canyon and local history. Free, but book early, as space is limited. 5. We spent over a month in Texas, so we purchased the Texas State Parks pass.....saves you money. A hard park to evaluate. Since this is a fairly new park, there is still a lot of minor construction activity. Finishing up the pool when we were there. Pads are concrete, not real wide, but long enough to park our car behind MH. Our site was sloped, as most were, but leveling was not a problem, just have to position RV in most level section of site. Utilities were all in good position, and good working order. Seems to be a lot of permanent campers, that are working in the area, but I think that is the norm with RV parks across the south. Owner and employees go out of their way to be helpful. Sites 97 thru 108 look to be choice sites. We had no picnic table. 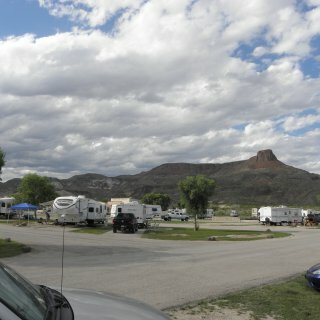 We camped at Longhorn RV Resort in a Motorhome. About 30 minutes from downtown Austin, and I35 is always packed. They do service RV's....anything to do with RV, but no chassis or motor work.